The Founder has returned to correct the wrongs of unjust. But to do that, he needs Hannah, a young woman from the city slums. She has a key to unlocking a power even greater than his own--if she can only learn to trust herself and the magic flowing within her blood. 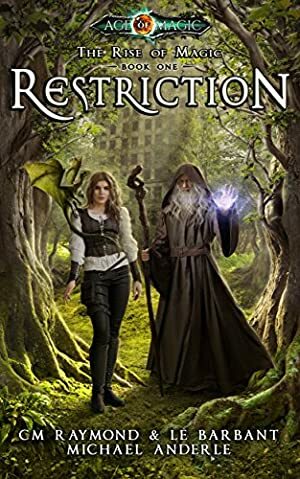 Set on the foundation laid by the Kurtherian Gambit Series, Restriction tells an entirely new story in the Age of Magic--and of the heroes and villains who battle for control of its destiny. Log In to track LE Barbant on eReaderIQ. to be notified each time the price drops on any book by LE Barbant. to stop tracking LE Barbant. Log In to track Michael Anderle on eReaderIQ. to be notified each time the price drops on any book by Michael Anderle. to stop tracking Michael Anderle. Log In to track Candy Crum on eReaderIQ. to be notified each time the price drops on any book by Candy Crum. to stop tracking Candy Crum. We started tracking this book on April 7, 2017. The price of this book has changed 11 times in the past 744 days. The highest price to date was £3.99 last reached on February 16, 2019.